Facebook has become a vast network to meet and chat with friends online. There are lot of people who used to chat online on facebook everyday, but after the facebook team updated chat section of facebook with a new one, most of the users are feeling it incomfortable. As it shows offline friends along with the online friends in the same window, and also show live feeds on top of the chat section, which has made some incomfortable feeling wih this new chat interface. 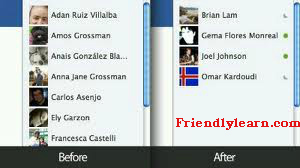 So if you are one of those who hate to see offline friends shuffled with online friends on facebook here is the trick. If you are using google chrome , then follow with the folling steps to hide your offline friends, you can also hide live feeds section of your facebook. - The above download link works only on windows os. - If you are on linux or mac platform then drag and drop This link to your bookmarks bar. - Hide your offline friends and start chatting with only those who are online!